Feeling quite pleased with myself I am. 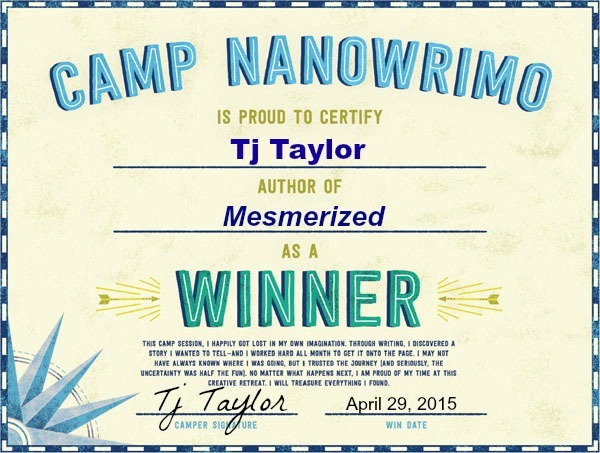 Yep, I’m writing a very self-serving post tonight to brag a bit that I accomplished a 3rd NANOWRIMO challenge with NANO April 2015 Camp. With a committed word count goal of 30,000 in the month of April to write a short story, it happened I am delighted to say. Especially since I’d had no intention of participating, let alone did I have even a project in mind…. until what was almost the 13th hour. I took a leap into a month of Creative Lunacy. Although I have written most of all my life, writing a short romance story was something I’d never done as an adult. There were many as a teenager I remember, but once married and raising a family my writing took a complete different direction. This NANO experience was completely different from jump street. My other two had a game plan at least a few weeks before beginning since the prior two projects had been brewing for some time in my mind. I also am doing a weekly radio show that I wasn’t committed to the other two times. I’d decided right away that I would publish the short story as web-fiction, building its own web site and post in a series of chapters. This time…. was so different. Almost out of the blue this story came to me. I listen to a lot of music, and I write by having music in the background. I have had music inspire me for many…many years, but I had never had music inspire a story. It just so happens that is what happened with Mesmerized. I heard an original track of music from a friend, an instrumental. I was inspired by a question asked, What visuals did the music create? The first two paragraphs of the story were born within 5 minutes in answer. I then a few days later decided to run with those two paragraphs and a premise. It’s completely fiction although based on a belief that I think many women can personally associate with. It was a fun story to write, to flesh out. I had the greatest time being the director of my character’s lives. It’s one of the wonderful joys I find in writing fiction, and as I get older there is even more delight in being able to live vicariously through the characters and events I design. Through fiction a writer can freely say out loud what they might not feel comfortable saying openly. Always thankful for the alter ego of my stories. I learn a lot about life through writing, and I learn a lot about myself. The past month was no different. Some of those lessons came to the writer within, some came to the woman within. Bravery in words is a wondrous magical thing. I am so very proud of you but, find it so much you. Sunshine Vibrations from the heart! You know…I could have written every word. This NaNo was transformative!!!! I cannot wait to read your story. I’m so proud of you!!!! So it is Rebecca and isn’t it kind of a super magic that thrills you to your core? Thank you Quad Sister for sharing your thoughts with me here. Congrats! Happy for you.Your last line “Bravery in words is a wondrous magical thing” grips. Wow! Now, there was certainly magic the way you said that! Thank YOU so much for taking the time to read but also for the time you took to share. Isn’t it so true that we can be far more braver in fiction work that we’re more comfortable revealing?